The human spirit has potential powers far beyond our wildest imagination. There is an imminent unprecedented shift in the western scientific paradigm that, when fully incorporated, will lead to far more meaning and purpose in our world. We have much greater power over our lives than we have been led to believe and Living in a Mindful Universe spells out why and how. Materialist science as a foundation for comprehending our reality is at a dead end. We are long overdue to rise above this facade, and this demands the robust incorporation of consciousness into our working model of the universe. A convergence of understanding about our approach to science, our universe, and ourselves is the only way forward. For those with the most open minds, this is where science finds itself now, in the early 21st century, as it finally comes closer to some understanding of the depths of the mind-body debate. This fascinating investigation into the fundamental nature of reality is directly relevant to us all. By cultivating an inner stillness deep enough to connect with our divine spiritual nature we can achieve greater influence on our health, gain enhanced insight and creativity and learn to influence the evolution of our unfolding reality, clearing a pathway towards harmony and peace in our lives and in the world-at-large. Our modern world often puts science and spirituality at two ends of a spectrum. 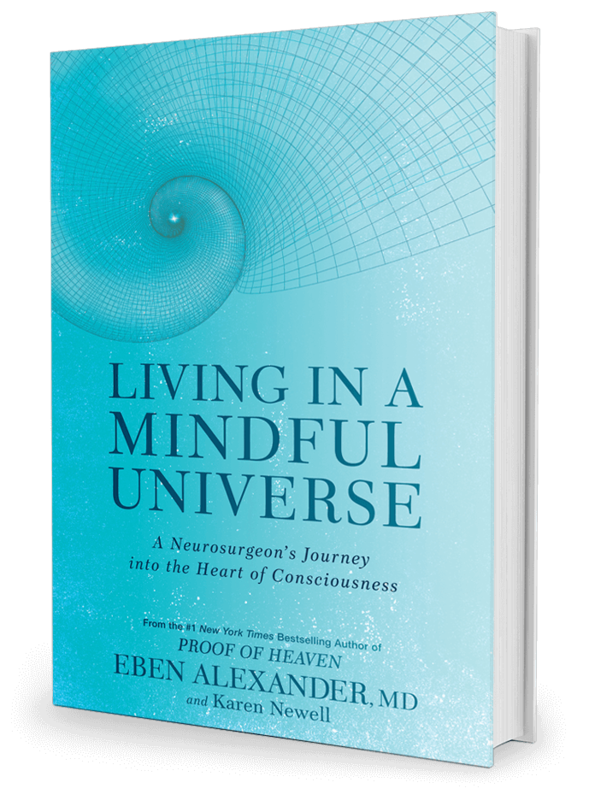 In this completely FREE 33-day course, using concepts directly from the book, Living in a Mindful Universe, we bring them together. Sign-up below to start your journey today. After registration, you will receive a Welcome email and then about one hour later and each day thereafter, around the same time, an email will arrive with a link to that day’s session. You may start at any time. A deep heartfelt and heart-full Thank you! to both of you, my words feel orphan to express the extent of my gratitude. As a doctor myself I have wrestled with the notion of a materialistic world back and forth a number of times in the course of my life, yet with the deep-down persistent conviction that there is more to our body, a conviction reinforced by a few personal experiences. Your course helped me live through a difficult period with the recent passing of my mother. My soul thanks you. I am new to the practice of meditation and mindfulness. It is a pleasant surprise to have all the resources you shared so generously in one place. Thank you both for this amazing journey, which complements the book so well, and also the Sacred Acoustics recordings which are amazing. I look forward to my continued journey of awakening! The initiative, Eben and Karen, to assemble each of the 33 days, for your spiritual and the curious audience is commendable, thank you very much. Feeding us credible information, delivered with a modern and first hand story, verifies that consciousness and science can coexist. It is a game changer! Thank you Eben and Karen, with love and gratitude for your generous and open sharing. Participating in the course has experientially strengthened this arising expanded awareness AND shaken the mental/conceptual frame. The material shared each day caused a shaking in the surface understanding but, equally, sounded and resounded a resonant bell/chime deep within. I have eagerly awaited every day’s email throughout the 33 days and for once I was not disappointed by unrealized promises that so often accompany new book releases. Au contraire! Every day I marveled at the agreement of my soul’s experience with the concepts in your daily lesson. It all seems so new and fresh to me even though I’ve been “awakening” for most of my life. Coming from the two of you, these truths provide solid validation of my life journey to date, and give me more confidence in my own ability to connect with the Source of all truth. No longer do I need to lean on any spiritual “guru” to guide me. Something profound and wonderful is happening, and you two are clearly front and center in this amazing global awakening. I did indeed devour your book, by the way, and am even more convinced that you two are heralding a new understanding of reality that needs to be widely disseminated. Thank you both x infinity! Thank you, Eben and Karen, for the 33 days journey. I have been so excited to receive your letter every day. Each message has improved my thinking and attitude vastly. I am looking forward to reading your book! Sincerely grateful. Best emails I’ve ever opened and so nice to know we’re from all different parts of the world. The Mystery is fantabulous and these daily reminders have certainly affirmed the larger perspective that we need so much. Love from Aus. This was such a comprehensible series and I really appreciated receiving it each day…. The end summary makes it so easy to access any lesson we wish to revisit. Thank you so much for everything you have done and also for inspiring me to continue and work on my awareness. Keep up the great work! Thank you Eben and Karen for your generosity and kindness in sharing this programme. I’ve really enjoyed the journey and it has given me much to reflect upon. I feel inspired as a result. I have faith and hope that these messages are being heard around the world as the consciousness of humankind rises and will one day part of the mainstream. Looking forward to reading your book and maybe meeting you one day.